Gaudete in Domino semper: iterum dico, gaudete. Modestia vestra nota sit omnibus hominibus: Dominus enim prope est. Nihil solliciti sitis: sed in omni oratione petitiones vestrae innotescant apud Deum. Rejoice in the Lord always: again I say, rejoice. Let your modesty be known to all men: for the Lord is nigh. Be nothing solicitous: but in every prayer let your petitions be made known to God. “Today, again, the Church is full of joy, and the joy is greater than it was. It is true that her Lord has not come; but she feels that He is nearer than before, and therefore she thinks it just to lessen some what the austerity of this penitential season by the innocent cheerfulness of her sacred rites. 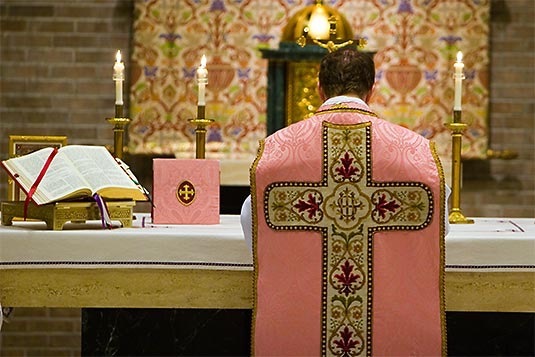 And first, this Sunday has had the name of Gaudete given to it, from the first word of the Introit; it also is honoured with those impressive exceptions which belong to the fourth Sunday of Lent, called Laetare. The organ is played at the Mass; the vestments are rose-colour; the deacon resumes the dalmatic, and the subdeacon the tunic; and in cathedral churches the bishop assists with the precious mitre. How touching are all these usages, and how admirable this condescension of the Church, wherewith she so beautifully blends together the unalterable strictness of the dogmas of faith and the graceful poetry of the formulae of her liturgy. Posted on December 14, 2014, in life, liturgy and tagged dom prosper gueranger, gaudete sunday, introit mass, liturgical year, third sunday advent. Bookmark the permalink. 2 Comments. That set is a LIFETIME of reading. I’ve had it for several years and I am getting more out of it every year. Well said Marc. Anything written by Dom Prosper Gueranger is worth taking the time to read…or re-read.